Hi everyone! Sorry I took last issue off. I hunted right into the holidays and found myself real short of time when Loretta's deadline came. She was nice enough to just suspend me for an issue and not fire me! For the next couple of articles I thought I'd offer some advice on blind retrieve handling for your dog. This is fun stuff to do, doesn't take a lot of time, and can really help your dog's level of training. "Handling is all about the dog having confidence in you. He must believe that you know what you are talking about when you send him somewhere and that there will be a bird waiting for him when he gets there." Handling is a fun thing to work on in the winter as you don't need a lot of cover. 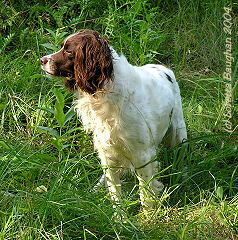 For spaniels, we have two basic types of handling. "hunt dead" and "blind" retrieves. 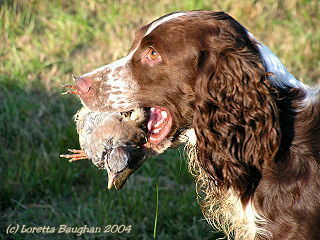 Hunt dead retrieves most often come into play in hunt tests as that is part of both the Senior and Master level tests. It can also happen in trials, but more often in a trial when you are handling your dog it will be to a known location. What is the difference you ask? (Please ask or this will be a very short article!) Simply, a hunt dead is sending your dog to an area to hunt for a downed bird without the handler knowing exactly where the bird is. You would ask your dog to hunt a piece of ground around some trees or a certain section of field. For a blind, you are asking the dog to go to a specific place to find the bird. The judge says the bird is ten yards left of that tree so your dog needs to go ten yards left of that tree. Same idea, just a little more definitive then the hunt dead. To teach either of these things, I like to use bird piles. I often use actual dead birds as I always have a bunch available. Most folks don't - so use something that your dog has fun retrieving. Tennis balls or bumpers, typically, are used. To start with, I'll drop three birds into a pile next to a flag. The flag is a marker so you know exactly where the birds are. Your dog may also figure out that the birds are by the flag and we can use this to help us in future sessions. Since I have flags all over my fields, most of my dogs give up on the idea of checking out flags - although for reasons you'll soon see, it is okay if they do recognize them at first. So, I take my dog, on a lead and drop three birds with the dog watching the whole thing. I will "hup" the dog, toss each bird and then say no bird and pull the dog away. This is good steadiness and control practice. I then heel the dog, walking about thirty yards away. To start with, I make sure that I am working in a crosswind so that when I send the dog he will have the scent of the birds blowing across his path. I line the dog up at heel and then draw an imaginary line from the dog's nose to the bird with the edge of my hand. Once the dog is focused in that direction, I step forward while giving an excited "back" command. The set up here is important as you are doing positive repetition. Don't just sit your dog down and call his name so he goes and gets one of the birds. Since you are practicing for blind retrieves, you are getting him used to him doing a certain thing: running on a particular line, when given a particular command: drawing a line with your hand and saying "back". So, the first time your dog does this he will run right out and get a bird. Move up closer while he is doing that so when you send him for the second bird you are only twenty yards away. If he doesn't get all the way out just keep telling him back while you walk closer. If he does a good job with the second one, send him for the third one from the same place. If he was shaky on the second one then move even closer for the third one. Repeat this exercise once and then quit for the day. It should only take you about ten minutes to do this. Short and sweet is better then long and drawn out. Now I'm sure you are thinking "where can I do this" or "I can't do this every day because I live in the city." Actually, this is a great city exercise because you can do it at park (if you can get away with the dog not being on a lead) using tennis balls. Use green or yellow balls in the green grass. Just put a little scent on them and the dogs can't see them in the mowed grass. On snow, use the yellow balls as they blend in well or use white canvas bumpers. On your next outing, do the same as on the first. Do the same thing in exactly the same place. Keep doing that until you can move back to 50-70 yards for all of the objects. Start with putting four to six objects out to retrieve. Make it as fun as possible for your dog; really praise him when he is coming back with a retrieve. Soon, he will learn that there is a pile there and he will go just as hard for the last one as he did for the first one. If you run into trouble, keep making it easier and easier until your dog succeeds. Then gradually make it harder and harder. Once your dog is getting good at the exercise, start deviating from the crosswind line. Start walking in a circle and sending your dog to the pile from different winds. Generally, dogs have the most trouble with a straight into the wind as they tend to want to vary to one side or the other to better use the wind. Now your dog is really getting it - so it is time to transfer this to a true blind retrieve. Up until this point, whenever you've dropped your objects your dog has watched you do it. This time drop your objects in the same spot without your dog seeing you do it. (You can try blindfolding him but it might be easier to just leave him in the kennel or car!) Take your dog to the same place you normally start from and send him back. Make these a bit shorter then the distances that you have worked up to as you really want you dog to succeed. Remember, if things aren't going well, make it easier and easier until your dog is finally getting it. This is supposed to be a postive exercise, so you should be prasing your dog and lavishing him with all kinds of praise for doing well. Handling is all about the dog having confidence in you. He must believe that you know what you are talking about when you send him somewhere and that there will be a bird waiting for him when he gets there. Once you can place the pile blind to the dog and reliably send the dog from 50-70 yards back to it in any wind, move the pile. Go to a different field. If you are using a visual marker such as a flag, take the flag to the new area and put the birds there. Again, make the retreives short the first time so your dog can do well. As long as your dog is doing well with that, keep moving to differnent places. Then one day take the flag away. Just make sure that you know where the birds are. That may seem like a no brainer kind of thing but since I could get lost in a phone booth, I really have to pay attention to those things. This process will get your dog going back on a line. The idea here is that the dog keeps going until they hear differently from you. Most of my dogs will break off their lines on true blinds before 75 yards and I'm okay with that. If I want them to break off sooner and start hunting, but I don't want to actaully handle them - as one wants on a hunt dead, then I'll give them a couple of toots on the whistle to break their line and tell them "okay". Most dogs will then start hunting from that point. Some dogs will get this process after a couple of weeks, but most of them will take a couple of months to really get proficiant at it. For the next article, we will talk about actual handling, getting your dog to do remote "backs" and "overs". Don't forget the liver treats! Jason Givens experienced success in the springer field trial game as an amateur. He then turned professional, nine years ago. Jason and his wife, Michelle, own and operate Lighthouse Kennels at Cambria, Wisconsin. 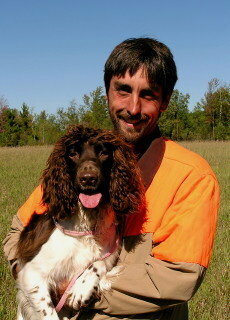 They train all flushing breeds for hunting and hunt tests, along with just springers for field trials. To that end, since 2000, he regularly finishes in the top-ten for the Hogan Award - which is the top professional springer handler trophy. In 2004, he was named the Hogan Award recipient. Jason has achieved several national championship placements in America and Canada, including winning the American National Open in 2003. In additon, Jason has judged numerous trials both sides of the border - including the Cocker National and the Springer National Open.